Supposedly there’s this guy named Bob Dylan? He wrote a song called “All Along The Watchtower.” That song was covered, quite famously, by this other guy – Jimi Hendrix. You guys heard of him? I wouldn’t have known either one, had it not been for Battlestar Galactica. Growing up in a Billy Joel/Beatles partisan household, my music education has some significant gaps. Dylan and Hendrix are two. Of course, I knew of them – I wasn’t that far under a rock, but I’d come up for a loss if you asked me to hum some of their tunes. It wasn’t until Battlestar Galactica used “Watchtower” for dramatic effect that I became aware of the song as a piece of music in its own right. The trend towards cross-promoting new and upcoming bands as a sort of product placement (“On tonight’s O.C., you heard music from…”) hasn’t really filtered into the science fiction genre yet. Then again, aside from John Williams’ scores, soundtrack music to epic space battles usually doesn’t make it to pop cultural consciousness. Already a fan of Battlestar, I came across a blog written by the show’s composer, Bear McCreary, where he explains the process of creating the score for each episode, from inspiration to instrumentation. It’s an education within itself, and the care and detail that McCreary puts into his process is evident. It’s somewhat technical for those of us not familiar with music theory, but McCreary takes the time to translate the nitty gritty. Does the music stand on its own? I can’t answer that for sure, as it’s embedded into my appreciation and emotional response to the show, but as scores go, Galactica‘s is deeply accessible. Familiar soundtrack instruments (violin, french horn) blend with more exotic combos (shaimsen, a Japanese string instrument, and bagpipes). The specific themes that McCreary has chosen for each season’s soundtrack are a good mix of shorter, two- to three-minute themes and longer seven-plus-minute acts. 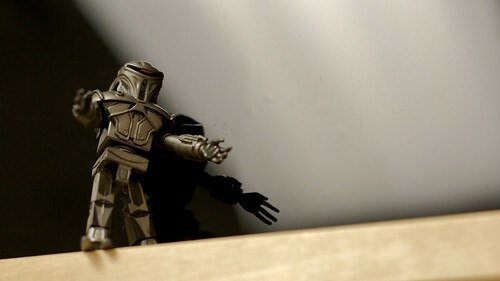 The civilization portrayed on Battlestar is supposed to parallel all parts of our own – so McCreary dips into multiple styles and musical tradition: the relentless Irish jig of “The Dance” in season three, the Italian lyrics for “Battlestar Operatica” that translate to a joke aria (“Woe upon your Cylon heart/There’s a toaster in your head/And it wears high heels”), and the hard rock of “Black Market” (unfortunately placed in a dismal episode of the same name, one of the few missteps of the series). McCreary can’t take credit for the main title, a full orchestral version of the Gayatri mantra, as it was created by miniseries composer Richard Gibbs, but he takes the cue and includes Sanskrit vocals to match up to the religious themes in the show. McCreary and his small army of instrumentalists who play things like the yialli tanbur and zurna aside, what captures me about these songs is the forward movement of every cue. A soundtrack is necessarily tied to the plot, but McCreary composes with such detail that it sounds the other way around, as if the music is driving the characters and the story. This idea becomes quite literal with “Watchtower” (spoiler), as the song creates the mathematical backbone for the coordinates that our heroes are destined to go to. McCreary tapped his own rock band brother, Brendan, to provide vocals on this version of “Watchtower” – it’s not my favorite – but his voice demands attention, even among the ghostly distorted guitars playing at 11 and a base line that drives it home. While the classic melody of the song stays the same, McCreary changes the guitar key and adds instruments (i.e. he replaces harmonica solo from Dylan’s version with a electric sitar and then adds harmonium and a variety of unique instruments) to create a distinctly Indian-inspired sound. McCreary’s reliance on heavy-handed percussion can wear you down over a season’s soundtrack, or in the show, but what makes this score more than background music is the way individual songs can stand alone, but combine to much more. One of my favorite songs, “Passacaglia,” in season one, mutates to three separate songs across seasons (“The Shape Of Things To Come,” “Allegro” and “Violence And Variations”) that resolve back to the original idea. Listening in for McCreary’s nods to musical and plot continuity in the last season was one of the great pleasures of the show for me. T-Sides always welcomes contributors. If you’re interested in writing something you think would be appropriate for us, get in touch! Previous postNew Music Videos: Cursive, Department Of Eagles, Fleet Foxes Next postNew Dirty Projectors: "The Stillness Is The Move"
Thanks Taylor and Taylor for the great review of a show I absolutely love, and for the version of “All Along the Watchtower” that my daughter has been looking for since the end of season 3.